PierPong is hosted by Pierpoint Design + Branding, a creative firm that has been part of the Spokane community since 2003. Known by friends and clients for its awesomeness, Pierpoint will now host an annual night of fun for the benefit of local kids. 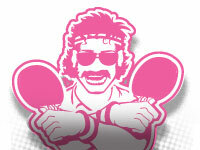 The proceeds from the PierPong Tournament will go to the YMCA's Friends & Servants Program. The program provides assistance to youth in Spokane County. YMCA programs help kids develop valuable skills, confidence and self-esteem.